Cornell Lab Publishing Group, 9781943645022, 32pp. 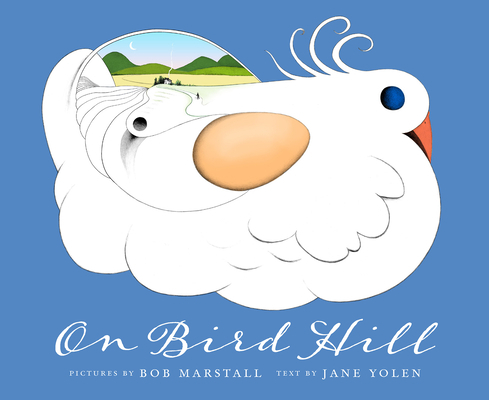 From iconic award-winning and NY Times bestselling children's author of more than 370 books, Jane Yolen, and award-winning illustrator, Bob Marstall, On Bird Hill is a wonderful new picture book created in collaboration with the esteemed Cornell Lab of Ornithology, the world authority on birds. On Bird Hill is first in a new Jane Yolen series created for the Cornell Lab, loosely based on the old cumulative nursery rhyme/song "The Green Grass Grew All Around," a nursery rhyme first published as a song in 1912 with words by William Jerome and melody by Harry Von Tilzer. But in this version, it's a boy and his dog who find the bird in a nest on a hill in a strange valley. This beautiful and enchanting story is sure to attract interest from millions of readers and fans of Jane's popular classics. As with all Cornell Lab Publishing Group books, 25% of the net proceeds from the sale of On Bird Hill goes directly to the Cornell Lab to support projects such as children's educational and community programs. Jane Yolen has authored more than 365 books including the Caldecott-winning Owl Moon, loved by children and bird watchers of all ages; You Nest Here With Me, a popular new favorite co-authored with her daughter Heidi E. Y. Stemple; and the New York Times bestselling series How Do Dinosaurs...Jane Yolen's books have been translated into over 20 languages. Many of Ms. Yolen's books are about wildlife subjects, especially the winged kind. She lives in Hatfield, Massachusetts. Visit Jane's website at www.janeyolen.comBob Marstall is the illustrator of nine nonfiction children's books, including The Lady and the Spider, which sold over a quarter-of-a-million copies and was a Reading Rainbow selection. Bob has also been honored with an ALA Notable Book award; an IRA Teachers' choice; a Smithsonian Magazine Notable Book for Children; and three John Burroughs selections. In addition, two of Bob's books are included in the New York Times Parent's Guide's "1001 Best Books of the Twentieth Century." Bob lives in Easthampton, Massachusetts. Visit Bob's website at www.marstallstudio.com.